Added on September 30, 2014 by Alex Teu. You may have heard that the cost of cloud storage is near zero. This has driven many cloud services to offer more and more free storage as part of their offering. 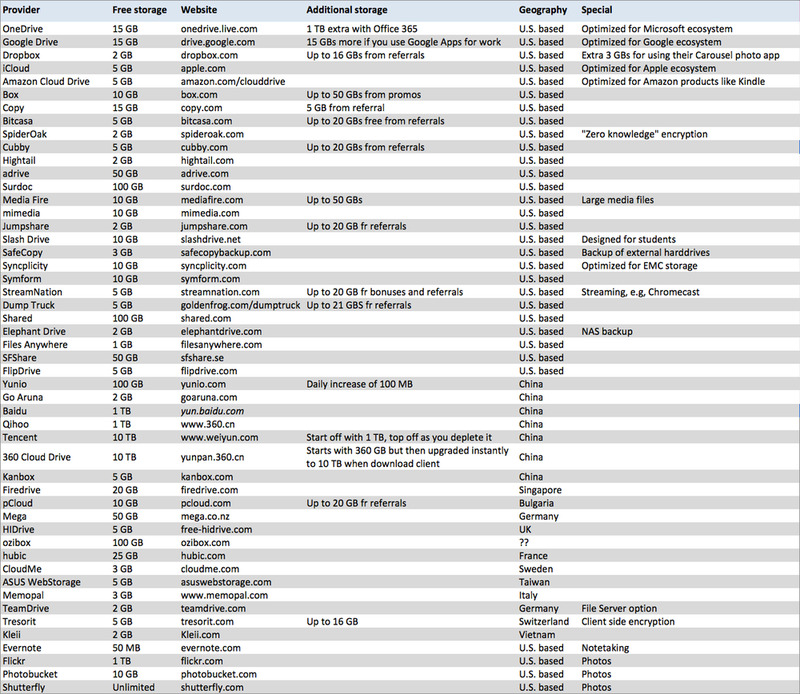 For your storing pleasure, I have collected below 50 cloud services that offer free storage. This list alone gives you over 23,000 GBs of free storage! Of course, not all services are created equal. Some offer a ridiculous amount of storage that most of us will unlikely ever use up (e.g. Tencent 10 TBs). Others offer a nominal amount that could be used up in short time if you incorporate it into your workflow (e.g. Evernote 50 MBs). Some services may be better suited for specific use cases like photo uploading, media streaming or backup from a NAS storage device. You may choose to utilize certain services because of geographical location. If you are going to make use of several services, as we all do, a good way to provide a unified experience is odrive. With odrive, you can access from a single folder on your PC and Mac several services on the list such as Dropbox, GoogleDrive, Box, and OneDrive, as well as Facebook and Instagram.